Raising the initial finance from personal savings, family or friends, redundancy payments or borrowing. Starting a new business is extremely risky and businesses are particularly vulnerable in the first 18 months to two years of operation. Indeed, about half of all new businesses fail within this period. Why is the failure rate of new businesses so high? Start-up costs are very high, e.g. the purchase of equipment and raw materials and the expense of buying or renting business premises. Recruitment and training costs can be significant as well as legal fees and marketing costs. Initial demand and sales revenue may be low as the new business has no brand recognition or customer loyalty. Indeed it may take several months before the business can produce any goods and services. Cash flow problems resulting from the combination of the two points above, which may kill it before it has the chance to trade successfully. Market research has been poor and there is inadequate demand for the goods and services produced by the business. Changes in the external environment e.g. the economy may move into recession or new competitors enter the market. Falling foul of unknown and/or un-researched legal restrictions, such as business registration, licences and insurances. Uncompetitive prices - small businesses do not have many economies of scale, which means that costs, and therefore, prices are higher than competitors. Poor location as the result of a lack of finance. The best retail and office locations tend to be very expensive. The personality of the entrepreneurs - do the founders have the commitment and drive to make the business successful if this entails long hours and disruption to family and social life? If setting up and establishing a new business is so risky, what are the incentives for individuals to start a business? they want to earn a profit and 'get rich'! What factors make a business likely to succeed and survive? Having a business idea which will sell in a competitive market place. Ideally, this idea should be different to products and series already on sale, creating a USP or Unique Selling Proposition (or point) for which customers are prepared to pay a price providing a profit. This, of course, is extremely difficult, given that most markets already have huge choice. Can the founders truly discover something different or innovative that will persuade buyers to give up their tried and tested products? Alternatively, some businesses have been successful producing a so called 'me too' product to start with and go for a marketing edge. 'Me too' products are basically adapted copies of existing products or services. However, it is essential that these products do not infringe the patents, trademarks and copyrights of other firms. Targeting a market segment large enough to support the business and provide a profit, and providing the opportunity for future growth. Possessing appropriate business skills and a desire to succeed. copyrights to protect ideas and artistic work, such as software, music, newspapers, books and films. 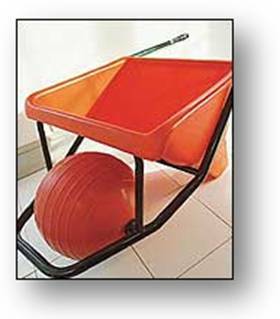 In 1974, James Dyson, an unknown industrial designer decided to become an entrepreneur starting a business with his sister and her husband to make the Ballbarrow. This was the first significant update of the wheelbarrow since the medieval era. Dyson's innovation used a plastic ball instead of a wheel for easier manoeuvrability. Like nearly all of Dyson's inventions, the idea for the Ballbarrow was driven by personal frustration, because his wheelbarrow kept getting stuck in the mud when he was working in the garden. In the late 1970s, Dyson had the idea for an innovative vacuum cleaner that would not lose suction as it picked up dirt. Five years and 5,127 prototypes later, the 'G Force Dual Cyclone' arrived and revolutionised the vacuum cleaner market. James Dyson offered his invention to major manufacturers. However, no manufacturer or distributor would launch his product as it would disturb the valuable cleaner-bag market worth $500 million every year, so Dyson launched it in Japan in 1986 selling direct to customers through catalogues. The G Force quickly emerged as a cult favourite, despite its rather high price tag. Dyson was forced to sue other companies for patent infringements, and the cases dragged on for years and nearly bankrupted him. After failing to sell his invention to any major manufacturer, Dyson was forced set up his own manufacturing company and in June 1993 opened his first research centre and factory in the UK. Dyson products quickly began to dominate markets around the world, becoming the largest selling upright vacuum cleaner in Western Europe, The USA and Australia. Naturally, following the success of the 'bag less' technology other major manufacturers began to market their own versions, some copying aspects of Dyson's cyclonic vacuum cleaners. Dyson sued Hoover UK for patent infringement and won around $5 million in damages. The company continues to expand, experimenting with new ideas and technologies (see the Dyson web site for details of their products). 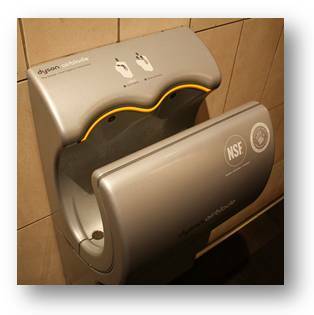 In 2006 Dyson launched a fast and hygienic hand dryer, using a 400 kmh. stream of air. A further development of Dyson's new air technologies is the innovative series of Air Multiplier fans using new design to draw in air and amplify it up to 18 times, producing an uninterrupted stream of smooth air with no blades or grill. 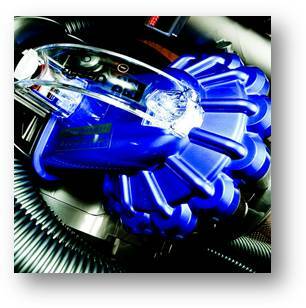 Dyson continues to be one of the innovative manufacturers in the world. Explain why Dyson wanted to set up his business. Analyse the problems that start-up businesses, such as Dyson face. Discuss the importance of protecting intellectual property rights for high technology companies like Dyson. A good or a service? A service firm is usually easier and cheaper to set up than a production firm, because there are fewer requirements to invest in materials, machinery, land and buildings as well as patents. There are fewer implications for cash flow as the business will not need to keep stock. There are still opportunities for excellent services, including those sold and/or distributed online. For example, most new software is downloadable, rather than being purchased using a CD. Online businesses are relatively cheap to set up and have fewer barriers to entry. However, during the 1990s, thousands of internet based companies were launched, commonly called 'dot-coms'. Most of these spectacularly crashed in the early part of the millennium, wiping out approximately $5trillion in market value from 2000 to 2002. The problem was that many of the business ideas were poorly researched and the products and services of a poor quality. Many of the online businesses failed to set up efficient physical distribution services and deliveries were delayed. The moral to the story is that business success rests on the quality and demand for product and service, not just the technology surrounding it. Sites that bring buyers and sellers together offer a potentially lucrative business opportunity. There are many 'big-boys' in the market place such as eBay and online shopping and price comparison such as Kelkoo. However, there are still specialist markets, which may not be saturated and where competition may be lower. Perhaps the founder enjoys playing war games such as Warhammer or Dungeons and Dragons? Could a hobby be turned into a business opportunity? Basing a business on a personal interest will certainly be motivating. It is possible to identify a market opportunity through reliable and valid market research. Field research - also known as primary research. Designed and executed specifically to identify a particular product or problem. This is 'first hand data' as it has never been collected before. Desk research - also known as secondary research. Based on old, existing data and information. It is, therefore, 'second hand data'. This may be available within the firm, or published externally. Much of the data will be in the public domain. The former is cheaper, but potentially inaccurate. The latter is expensive, but good if it is done well. This is an example of yet another potential business trade-off. These concepts are covered in more depth in the marketing topic. Where the business is going? How the owners will measure and monitor progress, especially in terms of sales and cash flow? These are basically the three questions that underpin all strategic decision-making. We will examine these questions in some detail in the strategic topic. The business often attempts to answer all these questions in its business plan (see topic 1.6). A business plan for a small new firm may fulfil the same role as the mission statement does for a large corporation. It sets out the overall intentions of the business in terms of objectives and strategic direction and therefore underpins the firm's decision making, by setting targets and providing benchmarks for actual performance including forecasts for profit, revenues and cash-flow. A major function of the plan is to support any application for funds, such as a bank loan. If a bank loan is required, the first thing that the bank manager is likely to want to see is the formal business plan. This tells the bank how serious the founders are, and how well they have researched the business, the market and the products and services it will sell.